From left, Ryan Rogers, Sensei Corey Green and Logan Blakeley pose after returning from the U.S. National Karate Championships. Both Rogers and Blakeley medaled at the tournament. 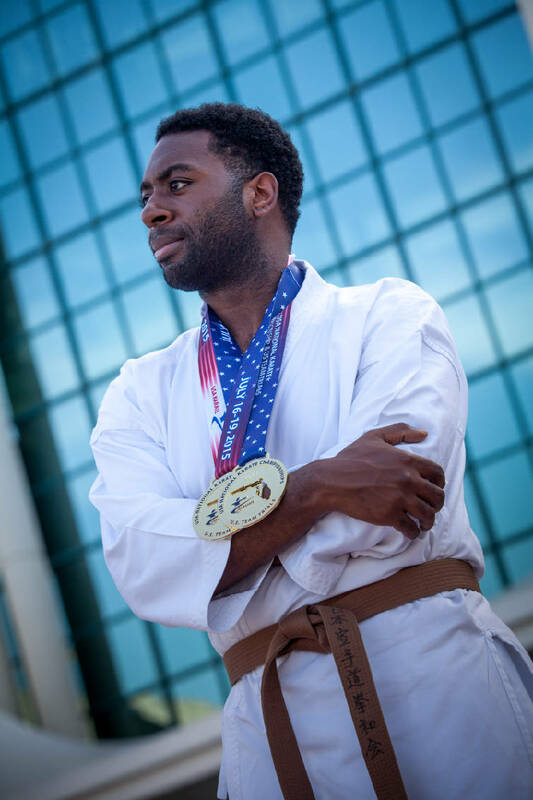 Ryan Rogers already has a storied career in the World Karate Federation, medaling in numerous national tournaments against both other athletes with disabilities and able-bodied athletes alike. A first-time trip outside the country, the chance to compete on an international stage at the Karate World Championship and making history. These are just a few of the things awaiting local athlete Ryan Rogers, who trains at Green's Karate in Hixson. Rogers is the first person with autism to represent the United States at the tournament being held in Austria later this month. He will be competing in the "intellectually disabled" category, one of three categories specifically for those with disabilities which also include "physically disabled" and "visually disabled." The 27-year-old Rogers has been training in karate for over half his life, and came under the tutelage of Corey Green of Green's Karate just over four years ago. Ever since joining Green's dojo, Rogers' goal has been to compete at the highest level. "I wasn't surprised, but I was a bit shocked that I'd gotten this far when I did," said Rogers. "It happened sooner than I anticipated." Rogers has a storied career as it is, winning numerous medals at Nationals against able-bodied competitors, as well as being the first individual with autism to have officiated at the National competition as a referee. He was diagnosed on the autism spectrum right before he joined Green's dojo, though he hasn't felt like it restricts him when competing. "I prepare before I ever step onto the mat to clear my head," Rogers said. "I take a deep breath once I reach the center of the ring, and once I get the nod from the official, all the distractions go away." Just to be chosen to compete at the world championships is a huge feat, but Rogers isn't looking to stop there. Both he and Green believe Rogers has a good chance at medaling in his division. When Rogers qualified earlier this year for the world championships, he and Green reviewed footage of some of the athletes he would be competing against. After their lengthy review, Rogers turned to Green and told him, "Sensei, I can beat them." "It's not often you hear that level of confidence from an individual with autism," said Green. "It's not overconfidence, though. He has the drive and passion for it, and teaching him has been a great joy." 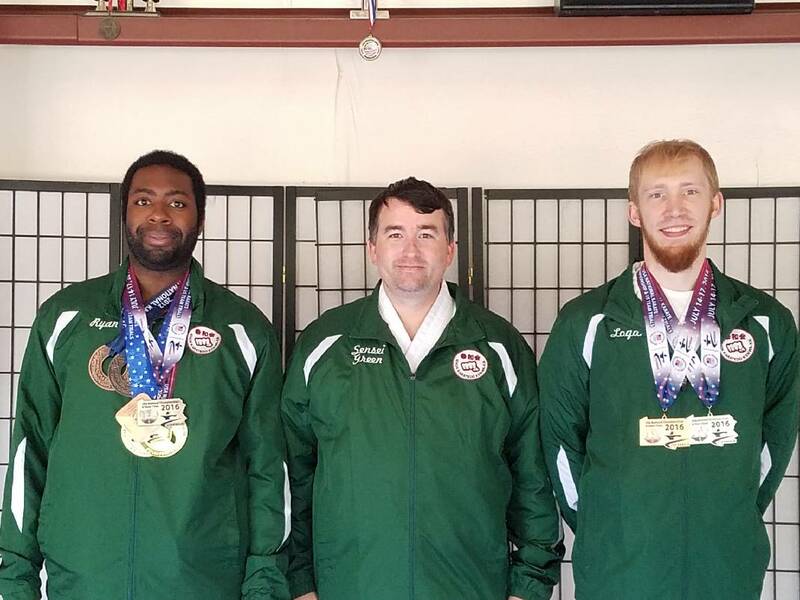 Green made headlines in 2006 when another student from his dojo, Brandon Earnshaw, was the first athlete with autism to compete at U.S. Nationals. Green said he has spent years refining his own method of teaching students with autism and other intellectual and physical disabilities, and is currently working on patenting his instruction style. "This isn't 'adaptive' karate. I'm not lowering any of the standards for them. Instead, I'm modifying methods from my general classes and changing it so they can better understand what's expected of them," said Green. "I think karate is very helpful for them. Teaching kata [the different forms of karate] provides order because of their basic structure." As for Rogers, Green has the utmost confidence. When Rogers first came to his dojo, Green immediately recognized his potential, and told him he would inspire millions of people before he was done. Rogers will get that opportunity in Austria Oct. 25-30. To help support his trip, they are seeking corporate and small business sponsors whose names will then be emblazoned on the warm-up jackets worn both at the event and in the documentary Green is co-producing, "Fighting Autism." Green's Karate can be reached at 432-5280. Email Shane Foley at sfoley@timesfreepress.com.